Unless you’ve been living under a rock, you’ll know that Robin Williams is a legend, having left behind a lasting impact. He could do anything, given the right material and platform. I always enjoyed watching his comedies as a kid and his life-affirming dramas as I grew older. 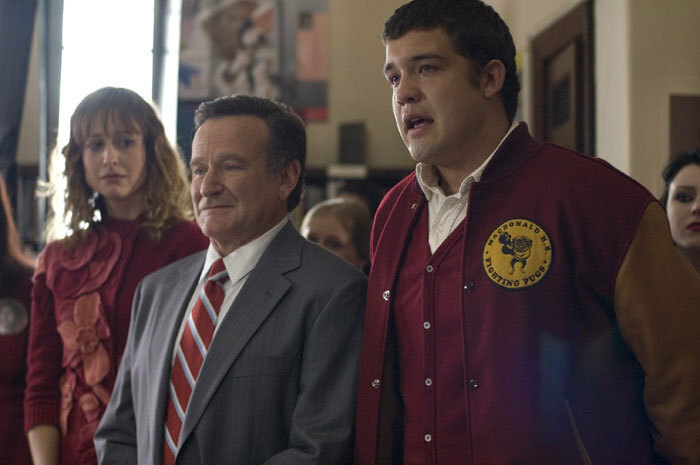 While Williams has starred in many beloved films in his long and varied career, he has a handful of good lesser-known films, like World’s Greatest Dad. This film is challenging, heartbreaking, uplifting and hilarious all at the same time. It’s one of the more twisted black comedies I’ve seen, but it’s thought-provoking and very well done. Here Williams plays Lance, an English teacher who dreams of becoming a writer but hasn’t had any luck getting published. He’s a single father of a horrible teenager named Kyle, the world’s worst son. Lance has found himself shuffling around aimlessly. He is discontent with his life, which has been made much worse by his son. Kyle really is a disgusting, loathsome and hate-filled kid. He doesn’t make any attempt to make friends or be liked by his classmates, and he refuses to listen to his father’s advice. He has no respect for anyone. What can you do with a child like that? Kyle is just an out and out nasty human being. Sabara’s performance is disturbingly good and I believe he should have received some recognition for bringing such a repulsive character to life. Even his dear old dad can’t tolerate him but feels compelled to love Kyle regardless. The film takes Lance on a difficult journey as he goes through the motions, yearning for the chance to release his stories to the world. The film doesn’t shy away from placing him in some horrendously awkward and uncomfortable situations. The film constantly shifts between drama and black comedy, and it’s darkly funny. World’s Greatest Dad isn’t for everyone, but what film is? I don’t what to spoil anything about this film, but things go from bad to worse after a major event, which leaves Kyle’s reputation in Lance’s hands. This strange family unit is in meltdown and it’s up to Lance to pick up the pieces. The film makes you question whether Lance is doing the right thing for his son and for himself. World’s Greatest Dad is a very niche, left-field movie that requires an open mind. Many people won’t get the point of this film, because of its odd approach, but this dark comedy deserves to have a place among a wider audience. It’s a very good film! Nice work bringing light to a very under appreciated and largely unknown movie. The fact that it is an indie is probably why it is buried, but another reason is its release was flanked by Man of the Year and Old Dogs in terms of Robin Williams-led vehicles. I have known a handful of people who saw it show up on Netflix and thought it was going to be more goofball nonsense like those movies, but it is far from that. Definitely worth a watch. Yeah it didn’t get a wide release or anything. But it’s very good, glad you liked it as much as I did.